Do you want to improve your English but are overwhelmed with all the choices of language schools? Many students face the choice of language schools before they even set foot in Canada. There might be tons of options, but students probably can’t help but notice that most schools offer the cookie-cutter kind of programs in which students sit in boring grammar, reading and writing, listening, and conversation classes. Lots of people want to come to Canada to attend university or college, or even high school. At most English schools you will be able to study general, business, or academic English. Unfortunately, however, most schools do not prepare students for doing anything in business or academic English. Most classes are just vocabulary. Often students believe that all they need is more vocabulary and better grammar. This is usually not the problem. These are the lyrics to a well-known children’s song. How do you feel about the rain? Does it make you feel “down” or sleepy? Is it refreshing? Does it remind you of home? Are you feeling worried about your next year at school? If you’re heading into university, congratulations! It’s another big step for you. I don’t have any secrets to share, but I’d like to tell you some study tips that helped me. “Weird and wonderful” is an English expression that means “strange and unusual, but in a lovable way.” It’s an affectionate way to describe friends who are unusual but still awesome. …Sound familiar? That’s because our school is definitely a weird and wonderful place to study! If you need proof, just check out this photo of me in a banana costume. At REV, we laugh. A lot. We cheat at board games – and then laugh about it. (Cheating is fine as long as you do it in English, right?!). We ask you to do strange projects, like taking apart a printer and using the pieces to build a model of a famous building. We get you to read children’s books to each other using expressive intonation (no robots at REV!). We let you decorate the entire school for Halloween. We give you advice like “stop studying.” And…we let you sit in Drew’s chair! What a happy place to work and study! I’m so blessed to be a part of this team. If you haven’t met us yet… welcome! And if you have met us already, please come back to say “hi.” Welcome to weird and wonderful Real English Victoria! SPRING SALE: $250 Unlimited Afternoons! Even though it’s a bit cloudy out, spring is here! Can you feel the energy in the air? It’s like waking up from a long sleep. For many people, spring is a time for new beginnings and new goals. We’re always trying to help people achieve their goals, which is why we’d like to offer you a very special spring sale. Save $100 on your English-learning journey until April 30. Come out and meet new people, refresh your English, and learn something new! Questions? Email us at office@realenglishvictoria.com. NEW REV IELTS STARTS MARCH 26th! 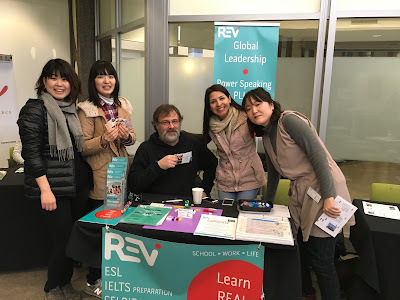 Seeing as a new session of REV IELTS is beginning soon, I thought I’d take the opportunity to give a little background on what to expect from my IELTS class at Real English Victoria and the test in general. Over the last 8 years of teaching IELTS, it’s been a privilege for me to have helped numerous students reach the scores they need to pursue their future goals. In that time, I’ve also seen a fair share of students who fail to get the score they need. Here’s some thoughts on why that happens.